Designed specifically to measure the gloss of surfaces that cannot be measured using traditional glossmeters, the Novo-Gloss flex 60 glossmeter combines the functionality and reporting of an advanced glossmeter with an ultra lightweight remote measuring head. Improved performance. The Novo-Gloss Flex 60 has been designed specifically to measure low gloss surfaces. 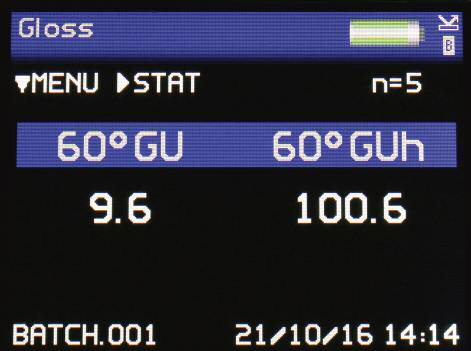 It features an additional measuring scale with a resolution 10 times greater than standard glossmeters. 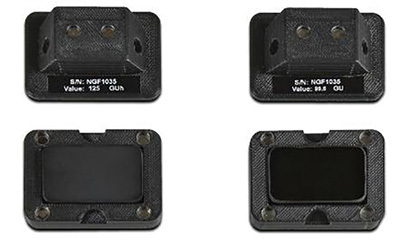 This increased resolution gives a far superior level of control of surface finish. 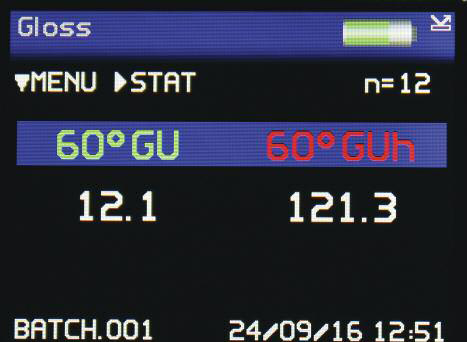 The Novo-Gloss Flex 60 complies to ISO 2813 and measurements made with the instrument are compatible with traditional glossmeters complying to these standards. 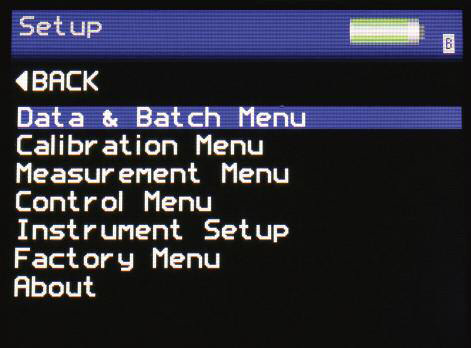 Measurement - Fast measurement of all parameters. 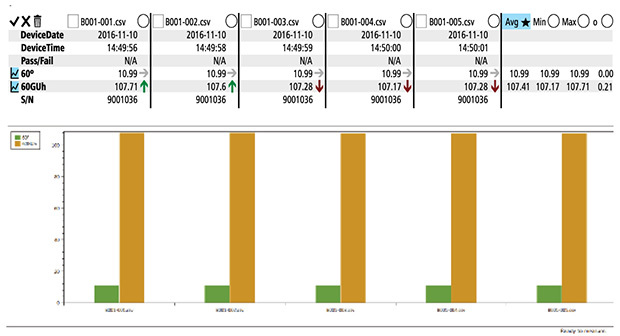 Full on-board statistics with graphical trend analysis and reporting. 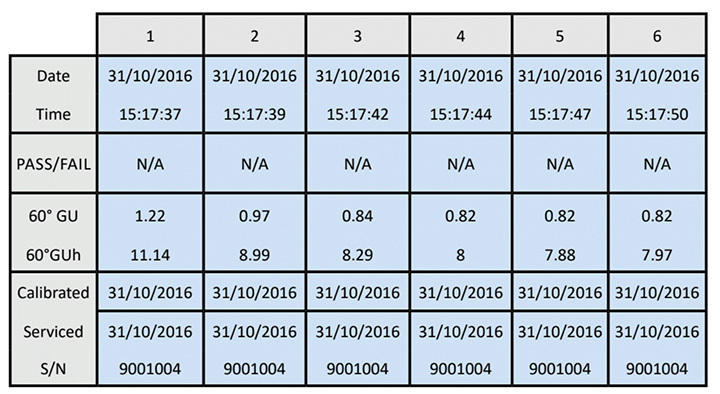 Easy Batching - User definable batch names and batch sizes for quicker and more efficient reporting. Rapid data transfer - Software-free data transfer. USB connection to PC instantly recognizes the device as a drive location which facilitates the quick transfer of files using Windows Explorer or similar. Direct data input via Bt wireless - Instantly transmit measured readings directly to programs such as MS Excel on your PC / tablet to greatly simplify the reporting process. Statistical Analysis: Max, min, mean, S.D. Gloss is an aspect of the visual perception of objects that is as important as color when considering the psychological impact of products on a consumer. It has been defined as "the attribute of surfaces that causes them to have shiny or lustrous, metallic appearance". The gloss of a surface can be greatly influenced by a number of factors, for example the smoothness achieved during polishing, the amount and type of coating applied or the quality of the substrate. Manufacturers design their products to have maximum appeal: highly reflective car body panels, gloss magazine covers or satin black designer furniture. It is important therefore that gloss levels are achieved consistently on every product or across different batches of products. Gloss can also be a measure of the quality of the surface, for instance a drop in the gloss of a coated surface may indicate problems with its cure, leading to other failures such as poor adhesion or lack of protection for the coated surface. It is for these reasons that many manufacturing industries monitor the gloss of their products, from cars, printing and furniture to food, pharmaceuticals and consumer electronics. 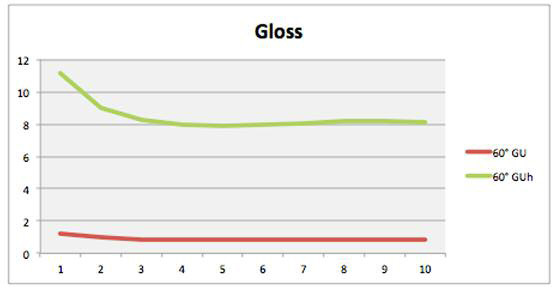 Gloss is measured by shining a known amount of light at a surface and quantifying the reflectance. The angle of the light and the method by which the reflectance is measured are determined by surface and also aspect of the surface appearance to be measured. 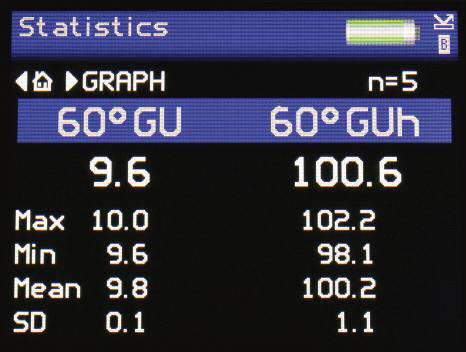 The unit of measurement for gloss is the Gloss Unit (GU) and the measurement scale at 60 degrees is 0-1000GU where 0 = a completely matte surface and 1000 = a perfect mirror. The Novo-Gloss Flex 60 has a measurement range of 0-125 GU and can measure anything from matte surfaces to high gloss finishes typically seen in the automotive industry. 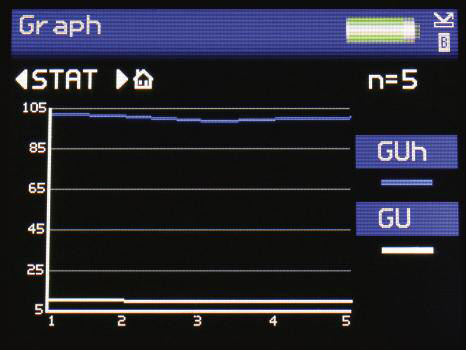 The additional measuring range of GUh provides a x10 resolution when measuring very low gloss surfaces of 0-12 GU. For measurement of gloss, haze and DOI (Distinctness of image) of mid to high gloss surfaces at 20°, please refer to the IQ Flex 20. The Novo-Gloss Flex 60 is supplied with 2 calibration standards for low and high gloss which gives increased accuracy and resolution for low gloss surfaces. 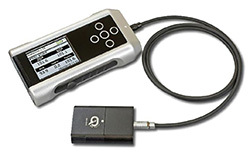 The calibration standards are magnetically enclosed which offers superior protection from contamination. The standards are magnetically attached to the instrument measuring head to ensure repeatable calibration. 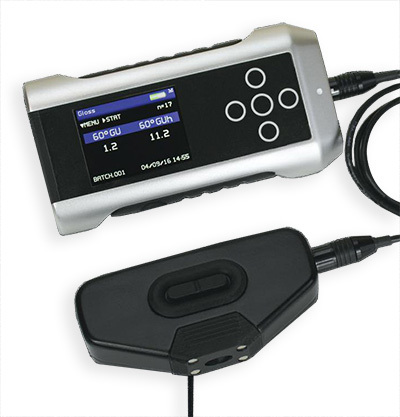 The instrument is supplied with interchangeable measurement adaptors. 2. Steel surface adaptor (magnetic) for increased repeatability for ferrous materials. Both adaptors can be replaced if they are damaged. The measuring head is ultra lightweight with integrated measurement buttons for single handed operation. 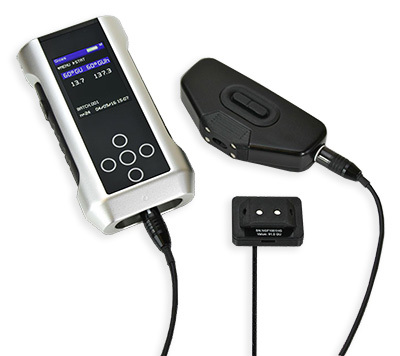 We are an established North American Distributor for Rhopoint Instruments, and have been providing, servicing, calibrating and certifying their high quality instruments for over 33 years.